Photo by U.S. Department of Defense. 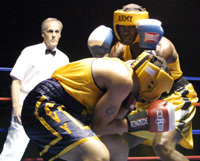 In the sport of boxing there is an old saying ‘Kill the body and the head will fall’. It means if you direct your attack at a foundational level (the body) then when your opponent lowers his guard it will make it easier to attack ‘upstairs’ (the head). It has been interesting to watch the church’s response to the release of the movie The Da Vinci Code. Mainline Protestant and Evangelical church leaders are standing up in droves (and rightfully so) to ‘de-bunk’ the anti-Christian claims made by Dan Brown, the author of The Code. And how is the church defending against this threat? By pointing to the evidence from various disciplines (both outside of and within the biblical text). It is showing that the evidence confirms the accuracy of the events recorded in the Bible concerning Jesus Christ, the facts surrounding his life, death and resurrection. In other words, church leaders are demonstrating that the Scriptures are accurate! We can take them as plainly written. 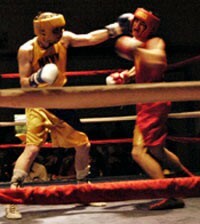 A boxer cannot afford to allow a solid blow to the head to land. So a clever fighter will also ‘switch up’ and come back to the body after attacking the head, often catching his opponent off guard with his body now exposed. Noah’s Ark, how could he get the animals on board? Many Christians today do not understand that the church’s failure to engage on the origins issue (the history of Genesis vs evolution) has led to the collapse of Christian credibility. For many Christians Genesis is a ‘side issue’, and the proclamation of the Gospel is all that is important. So, books like The Da Vinci Code that attack the Gospel message directly are treated as a serious threat. Because many Christians have compromised the straight forward foundational teachings in Genesis they have left themselves open to the ‘switch up’ of an unbelieving generation. However, if we look at the motivation behind the anti-Christian bias in our culture, we find that disbelief in what the Bible says about origins is, in many cases, at the heart of it. See what author Dan Brown said at a recent meeting. Obviously ‘solidly minded scientifically’ to Dan Brown means that we cannot accept the Bible as written. But evolution is not solid science; it is an interpretation of scientific evidence based on a philosophy of materialism. If Dan Brown had understood this he may not have rejected the history plainly written in the Bible. Christianity is based on a solid foundation of historical facts. These facts are defensible even against The Da Vinci Code claims. Now, more than ever before, Christians need to provide solid answers to the questions that non-believers have. The Da Vinci Code will undoubtedly get people asking questions about the Bible. They will not stop at the New Testament, however. Jesus is the author of all Scripture. We need to show the world they can trust the accuracy of the Bible both in the New Testament and from the very first verse in Genesis. We encourage all Christians to learn how to defend the facts of Jesus’ divinity, his life, death and resurrection. But go on to learn how to defend the basis for the doctrines of the New Testament concerning Jesus. The foundational history in Genesis explains why God the Father sent Jesus to Earth. He had to come and die as a sinless descendant of Adam because of the tragedy that took place in the beginning, as recorded in Genesis. For more information, see a critique of The Da Vinci Code. Dan Brown, The Music Hall, Portsmouth, New Hampshire, April 23 2006, ‘Writers on a New England Stage’ series.